Following a Chicago Reader investigation that alleged that Profiles Theatre had turned a blind eye to the abusive behaviors of artistic director Darrell W. Cox, and had created an unsafe culture for actors for decades, the theater announced late Tuesday night that it was shutting its doors after almost 30 years. As the Reader notes, Profiles shared the following statement on their website and on social media. On June 8, 2016, the Chicago Reader published an article entitled “At Profiles Theatre the drama—and abuse—is real.” For those who have not read it, I recommend you do so. The article’s overarching message of zero tolerance for workplace abuse is powerful and right. Unfortunately, I am the villain in the Reader’s approximately 12,700-word article. The article chronicles much of my life since joining Profiles as recalled mainly through selective accounts of three women in my life. Most of the article dealt with people’s views of my work as an actor, director and artistic director of Profiles. But a portion of the article made allegations about my private conduct. Many people who read the article did not recognize the distinction and seemed to believe everything in the article without question. Since that article appeared online, I have been called unspeakable names by people I have never met. My portrait has been plastered on social media channels with hatred-filled headlines. Our theatre has been defaced and vandalized. An activist group with whom I have never interacted has made me their Enemy #1. Our friends and family have been harassed and attacked with grotesque messages and threats. For the record, Joe Jahraus and I (Profiles artistic directors) have never and will never condone workplace abuse at Profiles Theatre. Abuse has no place in any work environment, especially one as emotionally exposed as the theatre. Our craft demands that we bring the most personal and intimate parts of who we are to an audience. All of our actors are here of their own free will. We value their trust in us. Profiles became a formal member of Equity theatre in 2012, but have performed under an Equity contract as far back as 2009. We joined Equity so our actors could have a voice. It was the right thing to do. We believe in the Equity code of conduct and have abided by the strong guidelines it establishes. Profiles Theatre wants to work with Not in Our House to further the Chicago theatre culture of respect for the rights of all actors. Any actions we can take to do better, we will. 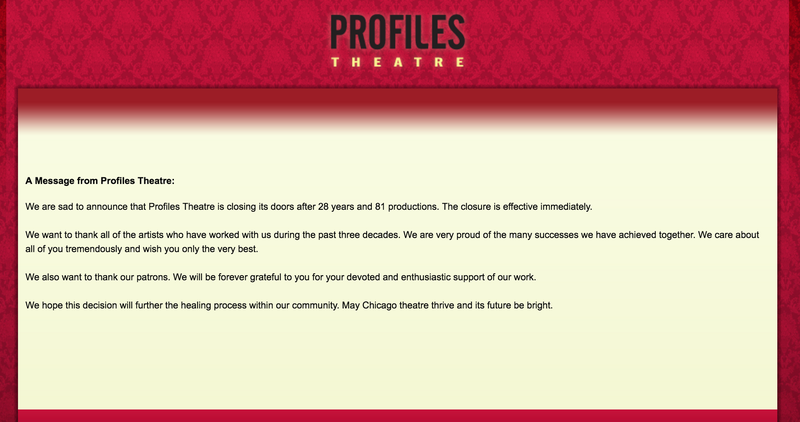 During the past 30 years, thousands of actors, crew and staff have worked at Profiles. We have achieved wonderful successes together. We have done so because we are a family – as the article points out that I’m fond of saying. What binds us together so closely is the inherent respect and trust we have for one another and all the artists that work with us. We devote many long hours together attempting to entertain audiences and bring life to the stage each and every moment. Unfortunately, the article has made it impossible for me to respond further to the women’s statements in a way that would convince anyone who believes their statements are accurate. I must rely, instead, on those who were and are a part of my life and Profiles Theatre to know the facts. In closing, Joe and I welcome a meeting with Lori Myers and Laura Fisher of Not In Our House so we can resolve our perceived differences and work together to fight for this cause. Please contact me through the theatre and I will return your message promptly. There have been other ripple effects from the piece. Penelope Skinner, whose play The Village Bike was supposed to open at Profiles this summer, pulled the script rights. Actress Sarah Lasko found herself being impersonated on Facebook by someone who wanted to make it look as if she was supporting Cox, while a few other actresses wrote personal pieces about their experiences working at Profiles. Since the Reader’s first piece, Piatt has written about his years as a theater critic in Chicago and his culpability in allowing Profiles to flourish by positively reviewing their often violent plays for years, as has Chicago Tribune critic Chris Jones. They can be comforted in knowing that eventually, in an incredibly rare turn of events, there was justice.